1 Over the past three decades, the share of American workers who are union members has fallen by about half. Union membership peaked in 1954 at nearly 35% of all U.S. wage and salary workers, but in 2015 the unionization rate was just 11.1%. However, according to the Bureau of Labor Statistics the actual number of union members has risen in recent years, from 14.4 million in 2012 to 14.8 million last year. 2 There is broad support for the right of workers to unionize across a range of occupations. Among six industry categories we asked about in spring 2015, about eight in-ten Americans (82%) said manufacturing and factory workers should have that right. Big majorities backed the rights of transit workers, police officers and public school teachers to do the same. About six-in-ten (62%) said fast-food workers should be able to unionize, while 35% opposed that. In general, though, Americans have mixed views about the long-term decline in unionization: About as many people said it’s been mostly bad for the country as said it’s been mostly good, though by 52% to 40% they said it’s been mostly bad for working people. 4 Nearly 15 million Americans are self-employed. A Pew Research Center report last year found that 14.6 million people, or about 10 percent of the active workforce in 2014, were self-employed. Those self-employed people had an additional 29.4 million people working for them; together, they accounted for 44 million jobs, or 30% of the national workforce. 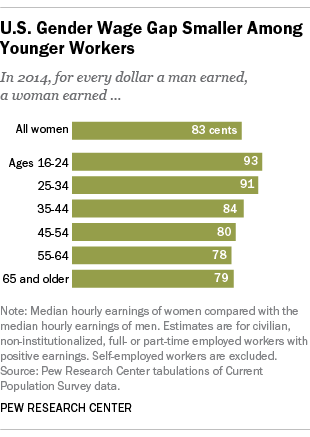 6 American women earn 83 cents on the dollar compared with men, but that gap is narrowing substantially among younger workers. 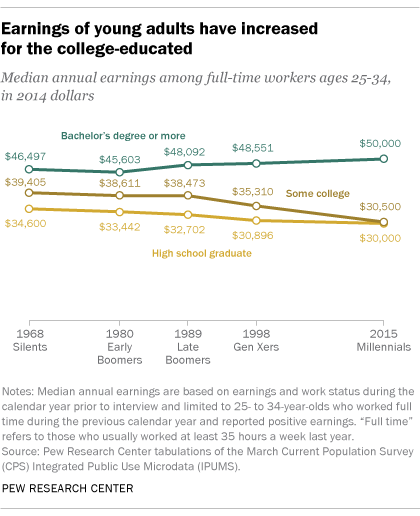 In 2014, among workers ages 25 to 34, women’s hourly earnings were 91% those of men, according to a Pew Research Center analysis of median hourly wages that includes full- and part-time workers. Among even younger working adults, ages 16 to 24, the gender wage gap lessens further, with women making 93% of what men earn. 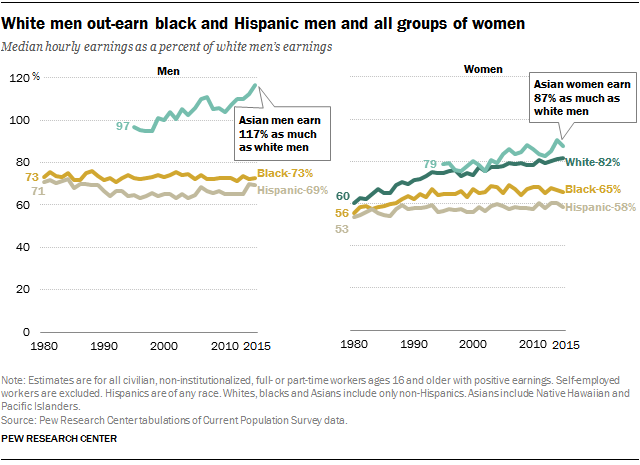 But there’s no guarantee that today’s young women will sustain their near-parity with men in earnings: The analysis shows that young women fall further behind their same-aged male counterparts as they age and deal with the responsibilities of parenthood and family. 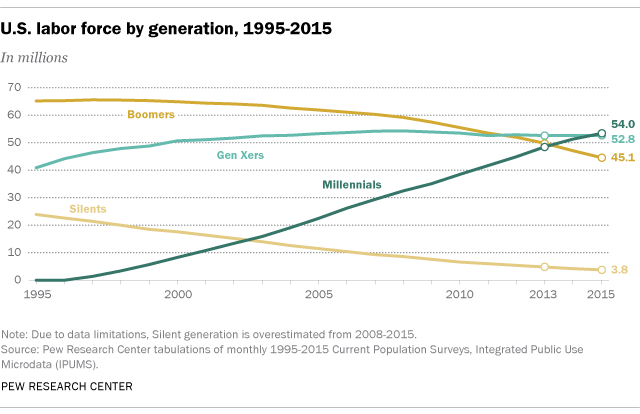 8 A much smaller share of U.S. teens work today compared with earlier decades. In the 1970s, ’80s and ’90s, most teens could expect to be working for at least part of their summer vacation. But the share of teens working summer jobs has dwindled since the early 1990s: After bottoming out in 2010 and 2011 at 29.6%, the teen summer employment rate edged higher but was still only 31.3% in summer 2014. (It had edged up to 32.3% by last summer.) The decline of summer jobs reflects an overall decline in youth employment in recent decades, a trend that’s also been observed in other advanced economies.